Our online store is currently down for upgrades. Please use our site materials just as a guide in your jewelry making until we relaunch the store. BeadHub is an online shop that provides a good selection of jewellery-making beads, findings and tools at reasonable prices. We have gemstone beads, glass, Swarovski, metal beads (silver, gold-filled, plated) and many others. We pride ourselves in having the highest quality jewellery-making materials, as well as making sure our customers receive the knowledge of the materials they buy, skills they need to design and make beautiful jewellery, and the science and lore surrounding the natural materials we offer. Our inventory specialists are keen, talented and promising designers working hand-in-hand with suppliers to create an enjoyable work environment. Many of our designers also offer design and workmanship services at various retail stores around the world in places such as Canada, Singapore, Thailand, South Korea and Sweden. Interested in this fascinating new material that lets you mold silver and gold clay into any shape and then heat it to create a pure 99.9% solid silver or gold creation? Look no further! BeadHub can supply you with the materials, the tools and the skills to create extraordinary custom adornments from fine jewellery with precious stones to belt-buckles and lighter casings! 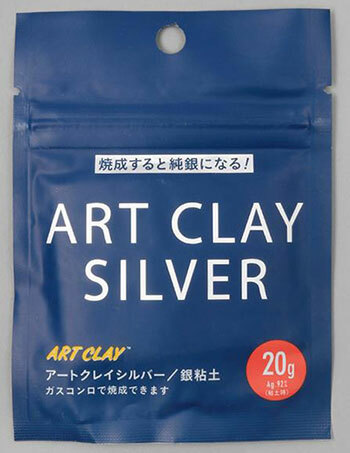 Art Clay Silver is a brand new pure silver material in clay form. It is water based and can be freely modeled like clay. It is made of finely powdered pure silver, water and organic binding agents (binders). After it is shaped, dried, and heated at 800C / 1472F for 30 min., binders burn off, leaving only pure silver retaining its modeled shape. There are 5 types of Art Clay Silver: Clay Type, Paste Type, Oil Paste, Syringe type and Sheet type. Clay Type: This type of Art Clay Silver can be modeled in the same way as water based clay. creating pure silver rubbed copies or imitations of leaves, origami crafts, etc. by repeatedly applying paste directly on them. Oil Paste: This is used as a binding agent for attaching accessory parts to Art Clay Silver, after firing. You can also use Oil Paste to repair cracks on already fired piece and/or attaching fired Art Clay Silver pieces together. Syringe Type: This is also made by kneading a certain amount of water in with the clay, thereafter loading the less viscous silver clay into a syringe, by which delicate lines can be drawn. There are 4 different types of syringe tips to draw various lines. Sheet Type: This is a sheet of rolled out clay type. Using this sheet saves you a lot of trouble rolling out clay evenly to create your desired shapes. All types of clay arrive well packaged as it dries quickly once subjected to air. Beginners are advised to have an idea of the design before getting started. Art Clay opened but not used can be stored wrapped in layers of plastic food wrap and stored in a air tight container. Art clay is easily molded, flattened or rolled into balls like regular clay. Any shape desired is possible by combining the different types individually or together. Textures are easy to apply with the most simple tools and the use of rubber stamps is easy and fun for beginners. This step is optional. When in the dry state it is easy and fast to smooth rough edges, fill in any small cracks with paste type clay or even gently carve into the surface to improve or develop the design further. The next step in the process is to heat the material to 800C in an electric kiln for 30 minutes. At these temperatures, the silver within Art Clay fuses together while the binders burn off, leaving a 99.9% pure silver creation. You can do this process at different temperatures and holding times; for example: 850c for 20 minutes or 870c for 10 minutes. The temperature and holding times may vary if you are combining your creations with other materials such as glass, porcelain and so on. Please contact us for more information. After firing, the surface of the piece turns into a crystalline whitish structure. By brushing, sanding and burnishing the piece, the metallic luster of pure silver is revealed. Whether you are a professional or a hobbyist interested in the science of gemmology, design of jewellery or the mystic side of minerals, Bead Hub hopes you will find our site useful and we look forward to making your jewellery-making experiences as enjoyable as possible.